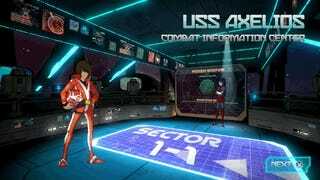 Galak-Z is a space shooter, which means fast reaction time and good command of controls. Galak-Z is also a roguelike, which means you’ll encounter randomized levels, enemies and loot. It’s damn important that you know that this is a game that looks like you should play it one way but is designed to be played a very different way. Because it so closely resembles the space shooters of the past like Sinistar, Galak-Z feels like the kind of game that wants you to play it fast and recklessly. But doing that will get you stressed out and killed quick. The new PS4/PC game from the makers of Skulls of the Shogun is a roguelike like Spelunky, and it constantly recombining various elements to provide fresh challenges every time you play. Galak-Z is structured like a TV show, with five episodes (which are levels) making up a season and five seasons all together. Lead character A-Tak is the last human pilot alive after an evil space empire ambushed and killed all of his comrades. His main goal in the game is running missions—finding food, energy crystals or killing big enemies—to help a hobbled star carrier get back to Earth. Earlier this evening, I finally reached the end of season 1 after playing Galak-Z since Friday afternoon on a pre-release review build. I died a lot. So let me share some insight I learned from many, many deaths. It sounds obvious, I know. But Galak-Z’s brand of spaceship movement is floaty and loose and the more familiar you are which how much to use thrust and/or boost in a heated battle, the better your odds are for survival. There’s No Shame in Hiding. Or Running from Fights. While you’ll occasionally run into a space insect out on its lonesome, you’re almost always going to be outnumbered in dogfights. The enemy Imperial ships patrol in groups, which might have burlier attack craft as part of their retinue. Even if you’re fine on health and shields, you may want to just sneak by if you can. Chances are, they’ll be there for the killing when you need to go back the way you came. The Permadeath in This Game Isn’t Messing Around. You Can Get Second Chances. Sort Of. Galak-Z has a currency called Crash Coins. They can let you buy upgrades after losing everything and restarting a season. But if you collect five of them, you can restart a botched mission and restore most of your lost upgrade loadout with a recovery crate, if you find it. You can augment the two default shields with temporary ones. Shields quickly regenerate over time but temp shields don’t come back if you take critical damage. If you happen upon a shop during a mission and have the dough, re-up on shields. You can use the right-stick camera control to pan around a bit and can occasionally see space bugs and Imperial ships attacking each other. Let them soften each other up before you go into the fray. The DualShock 4 touchpad opens up a map of the level, which gets delineated with pathways as you explore. Check it often to see if you haven’t left any loot behind after a heated battle. Don’t just go in guns blazing. Use the terrain to hide or angle shots. You can often get a missile lock on enemy ships before they catch sight of you, sometimes blowing them up before they get to fire a shot. When dogfighting, I’ve found that a stick-and-move strategy works best for me. Attacking and then backing off to let shields come back generally led to better results. If you think about Robotech and the other 1980s anime shows that serve as inspiration for 17-Bit’s space shooter, then the shift in ship shape won’t be too a big a surprise. If you’re playing Galak-Z as soon as the game unlocks and already have tips of your own, throw ‘em in the comments below. We’ll have a full review of Galak-Z later this week.